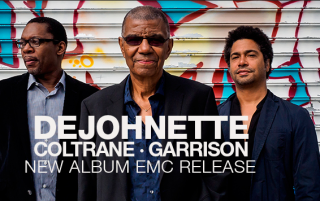 ECM Records is releasing a new album – DeJohnette – Coltrane – Garrison. After years of performances in the United States, Japan and Europe, Jack DeJohnette, Ravi Coltrane and Matthew Garrison got together in the studio in October to record a brand new album of original songs and renditions of classics. Produced by Manfred Eicher for an April 2016 release.